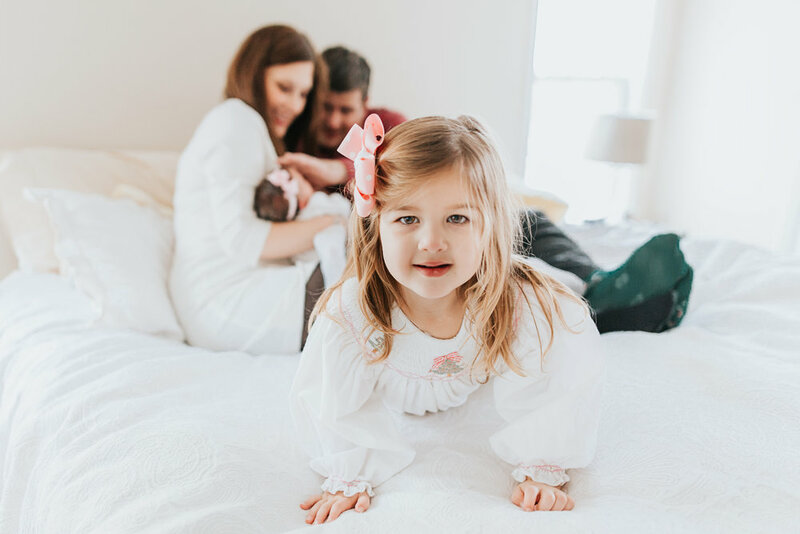 Lifestyle sessions offer a glimpse into the raw + real life of a family. Capturing moments and memories with a documentary approach will always be my favorite way to photograph and being invited into someone's home is always an honor. I love being in a place where people feel the most comfortable...where they can kick their shoes off and jump on the bed. And when you add a brand new baby to the mix, well, that's just the icing on the cake. The thought of going into someone's house and photographing them as a family used to scare the begeezus out of me (and to be honest, I still kind of get butterflies whenever I walk up to the door). But the more I shot in other's homes, the more comfortable I became. I've learned how to make my camera work for me in small spaces + I always come armed with my 24mm lens! My go-to lens for in-home sessions is the Sigma Art 24mm lens. This wide angle lens gives me space to get creative and always allows enough room to get everyone in the frame. It's just magical. I promise. I'm also pretty short (5'1"), so I struggled with being able to get above my clients with both my 35mm and 50mm lenses. I was always toting around a stool, looking for something to stand on and even just hovering/shooting/praying with other lenses (not really ideal, right?). Like all wide angle lenses, the 24mm does have a little vignetting around the edges of the images, but it's nothing that can't easily be corrected in post-processing. If you're an in-home photographer (and you probably are even if you just capture your kids at home), I couldn't recommend the 24mm lens more! It's been a game changer for all of my lifestyle sessions, especially my newborn sessions!